Introducing Keto Cocoa; the sweet, keto-friendly hot chocolate drink that will feel like a cheat-meal, without the cheat. Now, you can have the chocolate taste you crave, in a guilt-free hot cocoa that is ready in minutes. HERE'S TO YOU. You deserve a moment to spoil yourself. Keto Cocoa is a keto-friendly, sugar free hot chocolate that is gluten free, and contains no artificial flavors, sweeteners or colors. This low carb hot cocoa will make you forget that it's sugar free and will satisfy those chocolate cravings. THE DELICIOUS WEIGHT MANAGEMENT INDULGENCE. Keto Cocoa is your delicious "cheat product" without actually cheating. If you are on a Ketogenic Diet, Diabetic or live a Paleo Lifestyle this is the perfect product for you. Keto Cocoa is a rich and delicious hot chocolate drink that mixes effortlessly in just hot water; you really won't believe that it fits your low carb lifestyle! EACH SERVING CONTAINS SIX (6) GRAMS OF MEDIUM CHAIN TRIGLYCERIDES (MCT's), the preferred, healthy type of fatty acid to help your body generate ketones and keep you in ketosis. MCT's are quickly absorbed and create an ideal natural, sustained energy source for your body. Another amazing property of MCT's is that they contain high anti-oxidant levels and have known anti-inflammatory benefits that support heart & brain health. QUALITY IS JOB #1. 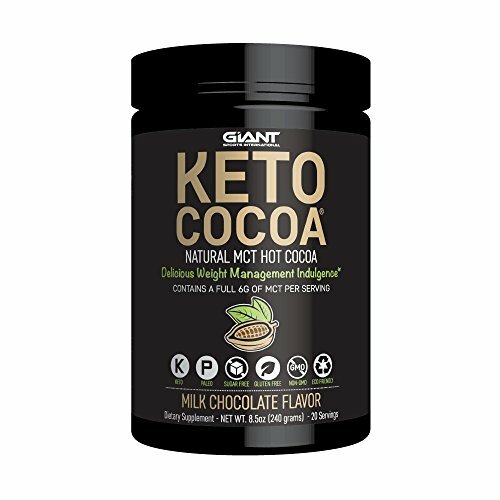 Keto Cocoa is made in an FDA registered facility in the USA, contains only non-GMO ingredients and is an eco-friendly product. So, you can indulge knowing that this product is both good for you and the planet as well. If you have any questions about this product by Giant Sports, contact us by completing and submitting the form below. If you are looking for a specif part number, please include it with your message.